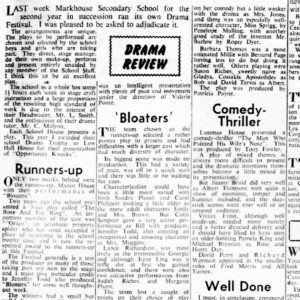 This Walthamstow Guardian Newspaper Report shows that a similar ‘Mark House Drama Festival’ was run in 1959 and it is hoped that a report for this earlier event will be found, and reproduced in the website, in due course. 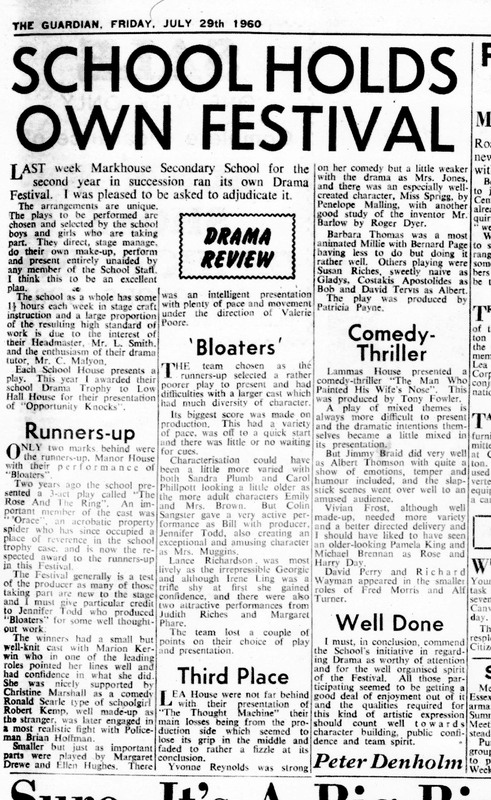 In the meantime this fairly substantial report of the 1960 Festival makes good reading – both in terms of adding to the Drama Club’s list of productions, providing a good number of cast names and, perhaps most significantly, commending the enthusiasm and positive results in the development of Drama within the School Curriculum – and all that was to follow! Unfortunately this did not include a photograph of the winning producer holding the trophy – nor, even more unfortunately, the producer of the runners up play with, according to the report, the apparently even more treasured and unique ‘ORACE’ trophy! ‘The Thought Machine’ – by Ella Adkins – Lea House – Produced by Pat Payne. Note: Complaints in triplicate please if the House Colours are incorrect – but it was a while ago!